Like any smart person on the internet, I have an e-mail account for stuff that’s not important or ads. You know what I mean, the e-mail you put in when some shop asks you to fill out a survey or whatnot. In any case, I have never bought anything from Ralph Lauren in my life but for some reason, I keep getting e-mails from them. One of them featured an ad with some figure skaters, including Mr. Windmill, Evan Lysacek as well as Meryl Davis & Charlie White. 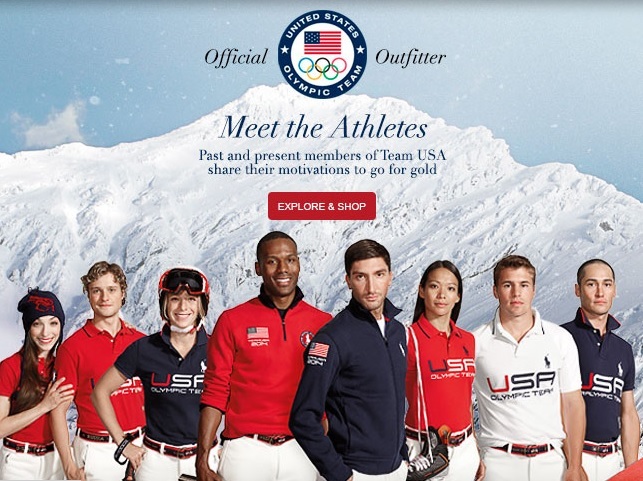 I’m really not sure what this ad is supposed to achieve considering none of the athletes look attractive in any of the clothing in this shot. Also, where is Evan’s trademark orange glow? I mean, what is Evan without his orange-ness? 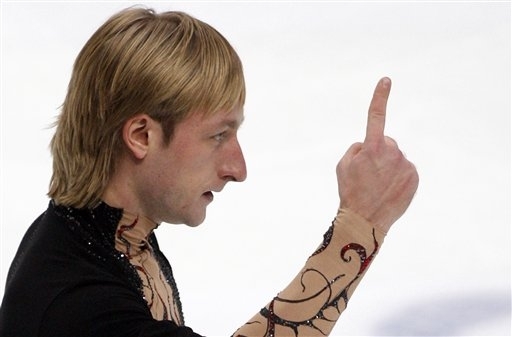 Olympic Figure Skating Starts in Less than 24 Hours! It’s been a whirlwind of posts and I’m all tuckered out. However, here is a roundup post of all sorts of links that can help you be the ultimate Olympic figure skating fan! Remember: figure skating events begin on February 6th while the opening ceremonies are on February 7th. For a schedule of events and information on all things Sochi 2014, here is the official website of this year’s Winter Games. This is the ISU’s official page for the Olympics. I will put up the link to the protocols and scores if they ever show up. I finally found the protocols page. Who’s a fan of the site redesign? Not me. For those who may not have access to a TV or all the channels, Hot Blades Hot Passion has written a post with a schedule of the figure skating events and livestream links. If you have trouble figuring out time zones and what not, here is the time in Sochi along with the times of all the Olympic events. Want to know who I think will win the Olympics? Check out my Olympic predictions post! Be an informed figure skating viewer! I did a series of Skating 101 posts explaining some of the basics in figure skating today. Check them out below! 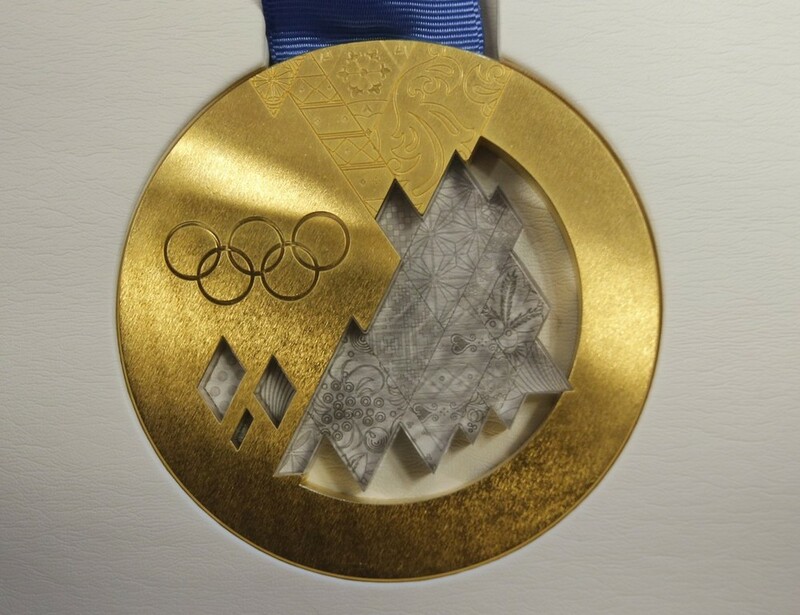 If you want to see what the athletes are competing for, here’s a post on the Olympic and Paralympic medals! Don’t know who the animals are in the picture above? They’re the mascots of this year’s games! See them and the other mascot contenders (and my snarky comments) in this post! Wasn’t paying attention to the entire figure skating season before the Olympics? I compiled a list of my favourite programs this season! Many of these programs are from top teams/skaters! You’re ready for the Olympics! 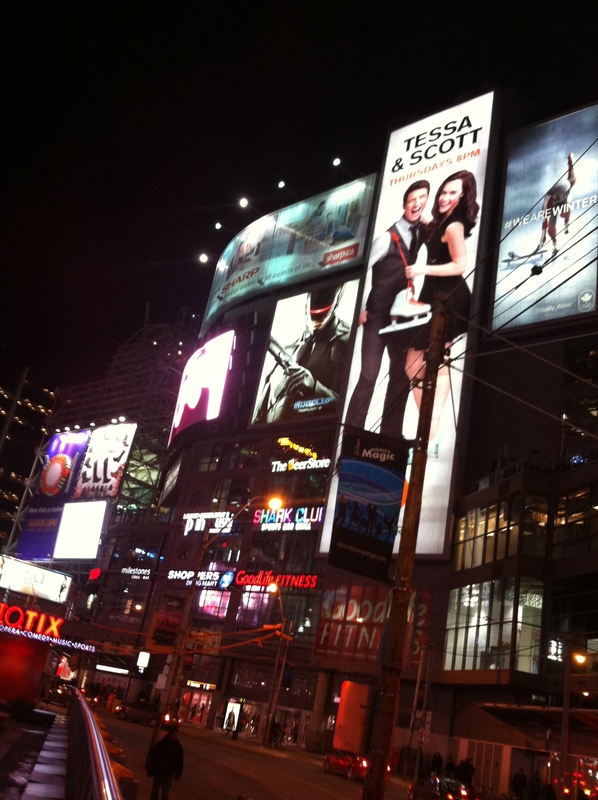 Tessa Virtue and Scott Moir have been in the spotlight this year for their new reality show. (If you haven’t tuned in and are wondering what the show is like, Dave Lease aka Aunt Joyce has a fabulous article on the first episode.) The advertising for this show has been quite intense; I’ve been bombarded by ads for this show many times while wandering around youtube. Although talk about intense, this is one giant billboard across from Dundas Square in Toronto (sort of like Times Square but not as cool for those of you who don’t now). What’s even more ridiculous is that if you look to the left of the picture, the bright screen was showing an ad for the show. I wasn’t able to take a picture, but across the street from this billboard and screen is another electronic billboard on top of the Hard Rock Cafe. 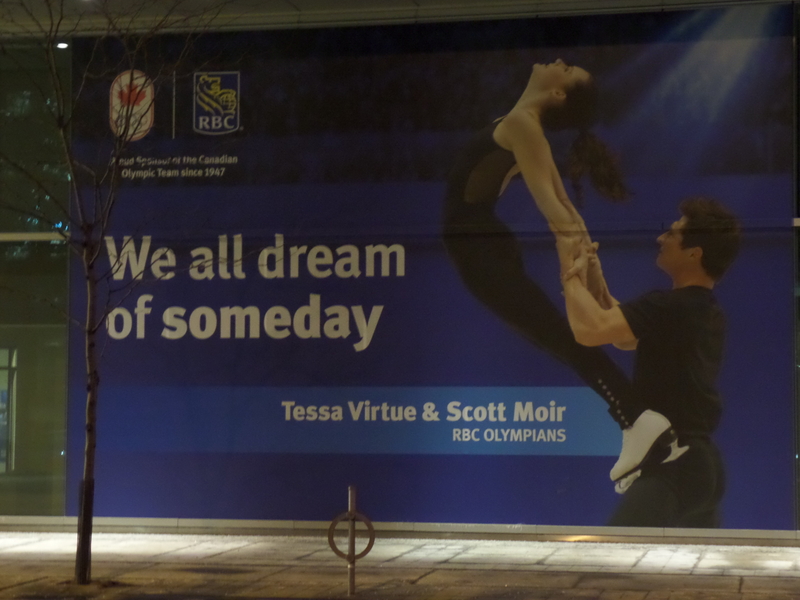 And yes, there were ads for Tessa and Scott’s show there too.